I've never tried it, but I have seen a couple of guys around here giving it a go. Land Sup ?? I've seen longboard riders with a big stick but I'm not familiar with Land Sup? Yeah i have a long board and a pole and sometimes do it when there is no wind at the park around the bike paths at Elwood and Stkilda, Built my own pole. Gives you a good upper body workout but looks a bit weird. Last time i tried making a big stick, when I tried it out on my three wheel cross bow mountain board, my rear wheel ran over the stick and snapped it. Was a real big effort to push along. Personally I go faster on the flats with my skate board and push off with my feet. Zac managed 30 km/hr on his skate board on the flats just pushing off with his feet. I manage about 22 during a sprint. How fast did you manage to go Jolli? The stick works well on a mild slope that gets you going faster than pushing speed. You can then use the stick for more speed again. It also works well as a brake if you need to slow down. If you have young children you can push them along too... so there are some uses. Ultimately with longboards i'm a purist. No engines and no sticks or brakes. Legs and sliding gloves! Yeh, Land Paddle is another word. I like it because I have a problem calf muscle and tendon, so ordinary traditional foot work pings my leg and I'm out for a while. So using the paddle/stick is great .I made my own out of a thick pole I shaped and fitted a 'T' handle and used a Kong dog ball for the foot. There are several variations out there some have a ball handle and the poles are made of several materials, alloy, wood, bamboo pole. Kahoona Big Stick is the popular one with its fancy shaped rubber foot. 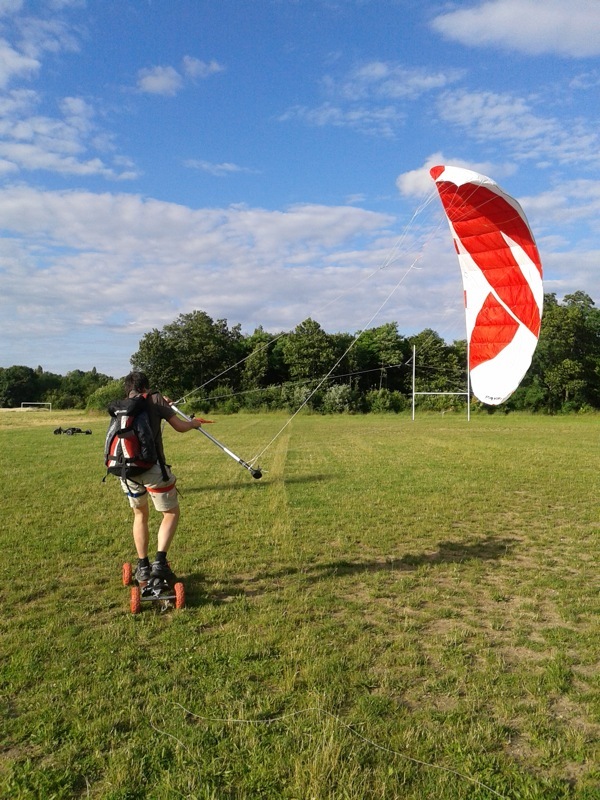 I mainly land paddle on flatland paths, parks and big shopping car parks, along with the odd beach front promenade . I found mountain boards were harder to use and not as good as a longboard. Ok it's not a fast down hill longboard style with slider gloves and full protection, but I like the chill out feel with land paddle and it gives me a good workout when there is no wind for kite landboarding or buggy. I plan on doing some video soon. Thinking of making a 'Hamboard' style board, but not a six footer, maybe just a 4 or 5 foot board. Have you tried a pumping set up? I've been getting a great workout using some carver trucks mounted to a super chili. It doesn't have the impact that pushing does but not sure this would be comfortable for you or not. It pumps so well that I can go up slight inclines. Pumping ( is it carving left to right with body motion to propell forward) is not a skill I have mastered yet, still working on it , maybe the trucks need loosening. I learned to pump on regular trucks, but only had limited success. To really get moving while pumping, you need a specialized set up. The basic principal is to have a very turny truck on the front and a much less turny truck on the back. This is achieved many different ways. You can take tkp trucks and wedge the front an dewedge the back. This makes the front turn more and deadens the back. A popular set up is a Bennett vector front truck and a tracker rear. I've not tried that yet. I use carver cx.4 truck set that comes as a set with the front and back trucks made different from each other and specifically for pumping/carving. Typically set up on a 15-17" wheel base deck with a kick front and back. It's used in pools or used on banks or just carving around. The long distance set ups use a little longer deck and use the Bennett tracker combo to keep height a little lower. The cx trucks have a higher ride height I think. I have am keen to learn this pumping technique, tried it every once in a while and was not able to sustain movement purely by pumping. So I read with inteterest on your suggested setup. I know from both skate boarding and from landboarding to avoid speed wobbles, steer with the front foot and leave the back foot alone. So you suggest similar for pumping, lose trucks in the front and tight trucks in the back. So here is my questioin, if the board does not twist, does not matter what stiffness the trucks front versus back are, the net turning resistance is the same with both trucks turning at the same rate, however if the board has some torsional flex, the front of the board could steer more than the back. So @ssayre is your pumping board rather torsionally flexible? Or have I missed something? i see what you are saying but I think the trucks are set up so you can lean the same but the geometry of the truck and the wedging causes one truck to pivot further than the other truck. I'll have to look into it further. Have a look at this video. There are several ways one can pump a skateboard. I use at least 3 of the methods. It really is fun mixing it up. Also, google "long distance pump longboard" or any variation of that and you will find all sorts of information regarding set ups on pavedwave and on silverfishlongboarding. This video is pretty cool I think and very helpful to understand the body movements in play. Like so many people really skilled at their craft this guy makes this look so easy. Really good action! Wow, that dude has some skill, looks funny wiggling but hey, he gets some speed going, and that's some hight on his board too. So that's how to pump. I see some injuries heading my way if I overdo it in my learning efforts. Steady and carefully for me. Thanks @ssayre, must be the best explanation of pumping I have seen so far and very entertaining. Ok the penny has dropped. So you need a board that can do tight turns, stiff board and differing truck angles front versus back (and tons of practice ). The board I have has too shallow a turn radius for pumping I suspect. Now to board height, the board in the video was high, whereas what I ride is super low. My son reckons the higher boards, even though more tippy give you more power to turn them. So what are your thoughts on low decks and or drop through boards for pumping, I suspect they are not suitable? Oh @Moroni-10, nice vid, love the green surroundings. First thing that came to mind was the song, What Shall We Do with a Drunken Sailor in Morning ..... the swaying I mean, not the alcohol.